I was heading down to visit my friend Jen who’s been ill, fighting cancer. She loves to cook and eat and when she’s feeling up to it, we really enjoy cooking together. During the times when she’s unable, I love to cook for her and her family. 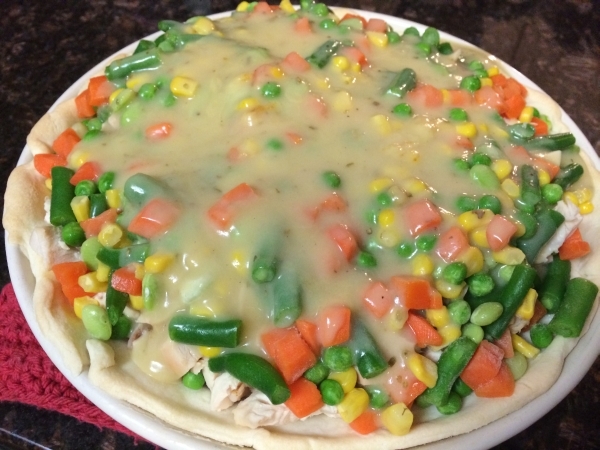 Understandably her tastes buds change from time to time and recently when she wasn’t able to pin point what she was hungry for wanting something mild, I decided to prepare one of my favorite comfort meals; Chicken Pot Pie. This is a really easy meal and makes enough servings to enjoy as leftovers throughout the week. 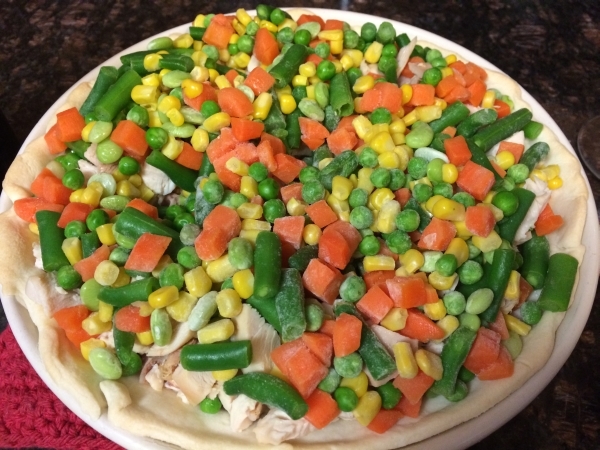 Though I keep my version pretty simple and cheat a bit by picking up flavorful, handy ingredients including a store bought rotisserie chicken and prepared pie crusts, it still tastes like homemade! 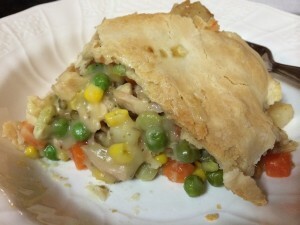 The nice thing about making pot pie is that you can have it as light or heavy as you want and you can choose what vegetables you wish to include in it. Give it a try and see if your family enjoys it as much as we did! Preheat the oven to 400 degrees. 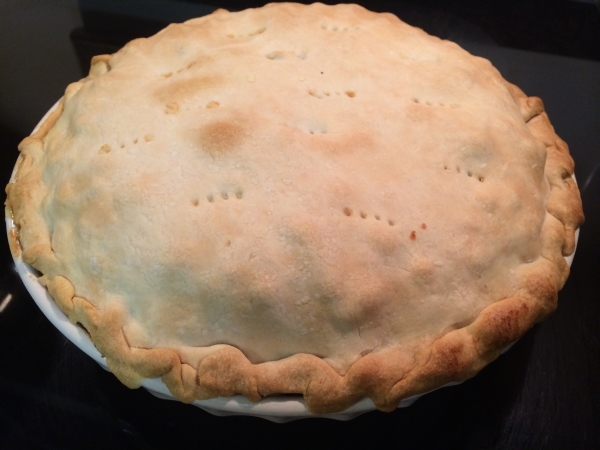 Line a large pie dish with one of the crusts. Press to fit tightly and poke holes with a fork. Bake uncovered for roughly five to seven minutes until pie crust starts to turn light golden brown. Meanwhile, saute the chopped onions in the oil for about five to ten minutes until they start to become soft. 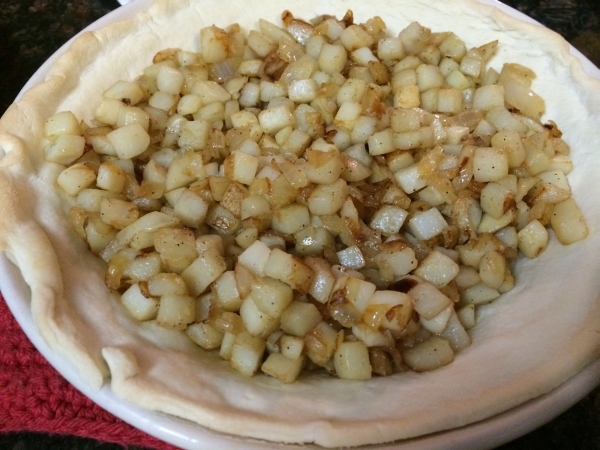 Add the frozen potatoes and par-cook to help heat them before pouring the mixture into the pre-cooked pie crust. In another pan, prepare the Roux (pronounced “roo”), which is a basic thickening agent used primarily for thickening sauces and soups. Start by melting the butter in a small pan. When the butter melts, stir in the flour. Use a spoon or a whisk and as you stir flour into the butter, you’ll see that a thick paste is forming. Cook it for a few minutes, until the raw flour taste is gone but the roux is still a pale yellow. Continue to whisk constantly while you add the stock to add that has been seasoned with bouillon to void lumps. Cooked until thickened. Next, add the chopped chicken and the frozen vegetables. Poke holes vertically through the vegetables, chicken and potatoes down to the crust with the back of a wooden spoon; but don’t penetrate into the crust. Pour the gravy into the holes and around the entire pie, but don’t over flow. 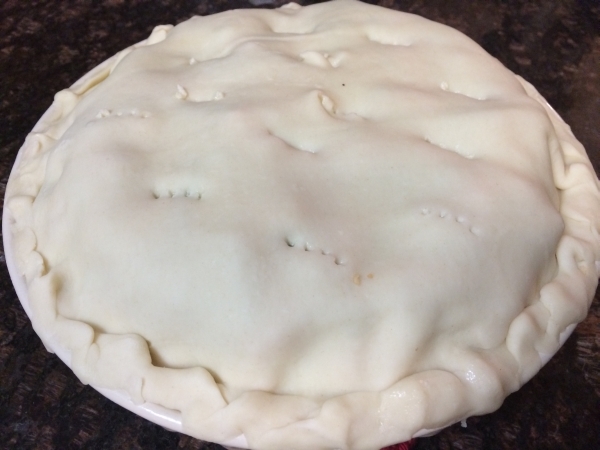 Place top crust on and crimp sides. Poke holes for the steam to escape about on the top with a fork. Bake 40 minutes to an hour or until the top is golden brown and the filling has been cooked through. If the crust edges start to burn, cover with foil. Allow to rest for about ten minutes to set up prior to cutting.